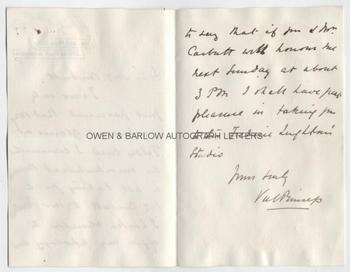 VAL PRINSEP Autograph Letter Signed. Valentine Cameron Prinsep RA, known as Val Prinsep. Pre-Raphaelite artist. ALS. 2pp. 1 Holland Park Road, Addison Road, Kensington. April 2nd 1864. To Mrs Carbutt. 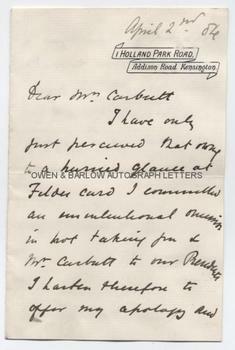 "I have only just perceived that owing to a hurried glance at Filde's card I committed an unintentional omission in not taking you and Mr Carbutt to our President. 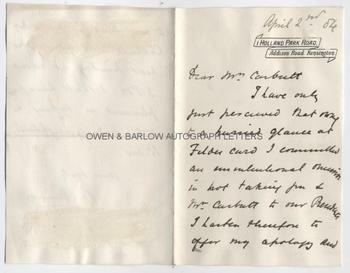 I hasten therefore to offer my apology and to say that if you and Mr Carbutt will honour me next Sunday at about 3 p.m. I shall have great pleasure in taking you to Sir Frederic Leighton's studio." 8vo. Approx 7 x 4.5 inches. Slight mounting traces to verso, else fine. Val Prinsep was the nephew of pioneering photographer, Julia Margaret Cameron and his mother was the great-aunt of Virginia Woolf and Vanessa Bell. He was an intimate friend of John Everett Millais and Edward Burne-Jones and he travelled with them in Italy where they together laid the foundations of the artistic movement that was to become known as the Pre-Raphaelite Brotherhood. Val Prinsep decorated the hall of the Oxford Union with DANTE GABRIEL ROSSETTI. The murals were scenes from Le Morte d'Arthur and two sisters were recruited as models - one of them, Jane Burden, became a favourite model of the Pre-Raphaelites and married William Morris. With other members of the Brotherhood, Val Prinsep taught at the Workingmen's College in London. He became a full member of the Royal Academy in 1894.